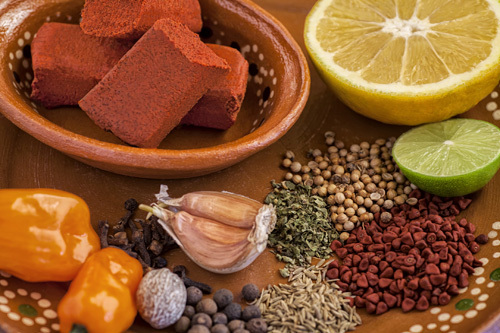 Achiote Paste - “Mayan Condiment"
The achiote paste gives to the dishes a flavor that is elaborated, strong, peppery, spicy, slightly smoky, sweetish and with nutty notes. As we have mentioned it is also a natural colorant , because all what it touches turns to a reddish color. This recipe is typical of Yucatan, it is used in various typical Yucatecan dishes and it is has been associated as Yucatan’s flavor. Although this condiment goes further back in history as it is of Mayan origins and it was widely used in their kitchen and painting. This paste is also known as “red recado" and in Yucatan is very easy to get it because it is sold at any stall, where they are arranged in columns and they look like little bricks. Making the achiote paste is easy but laborious. The preparation of this paste requires a good spice grinder. The spices are a very important part of the seasoning that we get in the final result. The achiote paste is prepare with bitter orange, if you don’t get it you can substitute it for 1/4 cup of sweet orange mixed with 1/4 cup of white vinegar. The texture of this paste must be thick, just a little softer than a plasticine block. The achiote is soaked for 1 day and then the preparation takes 10 minutes . The recipe is for 1 cup. Verify that the achiote seeds that were left soaking are soft, if not leave the soaking for a longer time. 1 teaspoon of Cumin seeds. 1 teaspoon of whole Allspice Berries. Grind very well all the spices, until having the consistency of a fine powder; then set aside. Remove the seeds and the veins of 2 habanero peppers. Put in a blender the 2 habanero peppers with the ones you worked. The Powder that was obtained from grinding the spices. The juice of 1 Bitter Orange. 1/2 cup of White Vinegar. If the paste comes out too thick, you can add more bitter orange juice and white vinegar in the same quantities, until achieving the desired consistency. Tip: If you have some achiote seeds left you can put one cup of oil (olive or vegetable) in a skillet over low heat, add the achiote seeds that were left and leave them frying for about 5 minutes. Then strain the oil and you will have a delicious achiote oil that will give a great seasoning to any dish. Variations: We remind you that what you just prepared is the red recado and there is also the steak recado and the black recado. Did you like the Achiote Paste? ᑀ Experiment cooking an Appetizer with Achiote Paste. ᑀ Know the Mexican Food Colors. ᑀ Enjoy a Mexican Drink. To make the achiote paste you need a good spice grinder like the KRUPS. This grinder is fast, powerful, easy to clean and the best is that it grinds uniformly. If you need achiote seeds these are fresh and of very good quality. For this recipe you also need a good blender and the Ninja is excellent.